Get ready to make reading your student’s favorite subject of the day! This is a delightful, developmentally appropriate method for learning to read. 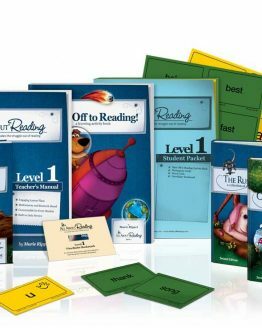 Please note: In addition to the Level 1 Materials, you will also need to choose either the Basic or Deluxe Reading Interactive Kit. The Interactive Kit contains non-consumable items that are used throughout the entire All About Reading program. 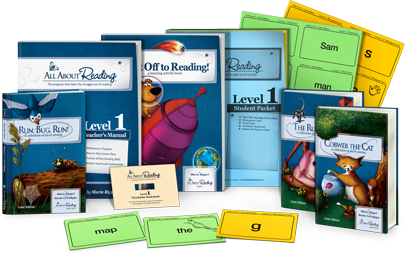 Your student will learn exciting new concepts, including letter sounds, phonograms, consonant teams, blending, syllables, sight words, consonant blends, plurals, compound words, and much more. Every component of reading is taught: decoding (phonics and structural analysis), vocabulary, fluency, and comprehension. IMPORTANT NOTICE: THIS EDITION WILL ONLY BE AVAILABLE IN MARCH 2019. PLEASE STILL PLACE AN ORDER TO SECURE YOUR STOCK!